- Chicago Comiskey Park (July 29, '60) = The Sheik took down Prince Maivia. - Detroit Bruiser vs. Karras (April 27, '63) = The Sheik beat Chief Kit Fox. - Montreal All-Star Wrestling Stadium Show (July 17, '72) = The Sheik fell to Jacques Rougeau Sr.
- Mid-South Coliseum (July 15, '74) = The Sheik fought to a No-Contest with Jerry Lawler. 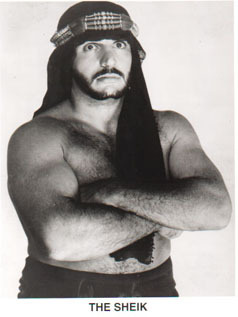 - Mid-South Coliseum (November 3, '75) = The Sheik, as the United States Champion, lost, via DQ, to Jerry Lawler. - Mid-South Coliseum (November 10, '75) = The Sheik lost, via DQ, to Andre the Giant. - Mid-South Coliseum (March 21, '77) = The Sheik, as the United States Champion, lost, via DQ, to Bobo Brazil. - Mid-South Coliseum (May 2, '77) = The Sheik retained the United States Title, fighting to a Double Disqualification with Jackie Fargo. - Toronto Exhibition Stadium (June 5, '77) = The Sheik lost, via DQ, to Tiger Jeet Singh. - Toronto Exhibition Stadium (July 10, '77) = The Sheik lost, via DQ, to the NWA World Heavyweight Champion, Harley Race. - AJPW World Open Tag League '77 (November/December) = The Sheik & Abdullah the Butcher lost in the finals of the league, via DQ, to Terry & Dory Funk Jr.
- AJPW Sumo Hall (December 9, '78) = The Sheik & Abdullah the Butcher won, via DQ, over Terry & Dory Funk Jr.
- AJPW Real World Tag League '79 (November/December) = The Sheik & Abdullah the Butcher lost in the finals to Terry & Dory Funk Jr.
- AJPW Real World Tag League '80 (November/December) = The Sheik & the Great Mephisto competed in the league, which was won by Giant Baba & Jumbo Tsuruta. - AJPW Real World Tag League '81 (November/December) = The Sheik & Mark Lewin competed in the league, which was won by Bruiser Brody & Jimmy Snuka. - AJPW Sumo Hall (December 13, '81) = The Sheik & Mark Lewin lost, via DQ, to Curt Hennig & Harley Race. - Tri-State Wrestling Winter Challenge II (March 2, '91) = The Sheik fought to a Double Disqualification with Abdullah the Butcher. - Tri-State Wrestling Autumn Armageddon II (September 21, '91) = The Sheik lost a "Steel Cage" Match to Abdullah the Butcher. - FMW Tag-Team League '91 (November/December) = The Sheik & Sabu competed in the league, which was won by Tarzan Goto & Atsushi Onita. 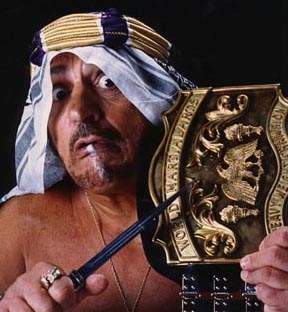 - FMW 4th Anniversary Show (May 5, '93) = The Sheik & Sabu defeated Dr. Hannibal & Dr. Looser. - FMW Summer Spectacular '93 (August 22) = The Sheik & Sabu lost a "Stretcher" Match to Terry Funk & Tarzan Goto. - FMW Year End Spectacular '93 (December 8) = The Sheik & Sabu were beaten by Dr. Hannibal & Dr. Looser. - ECW The Night The Line Was Crossed (February 5, '94) = The Sheik & Pat Tanaka won over Kevin Sullivan & the Tazmaniac. - FMW 5th Anniversary Show (May 5, '94) = The Sheik lost to Terry Funk. - FMW 6th Anniversary Show (May 5, '95) = The Sheik pinned Damien.